A rematch of last year’s Preliminary Final unfolds at Voxson Oval on Saturday in a contest which throws in the added twist of a long-held record and contrasting opening round form. Aspley and Southport’s Round 2 blockbuster comes after the Hornets’ dismal Round 1 performance against Sydney University in last week, and the defending premier cruising past Redland at home. It was the Sharks who ended Aspley’s run towards the Grand Final last year after a season where the Hornets beat them twice in the minor rounds. The Hornets will be confident of defending an impressive record against Southport on their home deck, but the Sharks won’t go down without a fight in an early season grudge match not to be missed. It wasn’t the start new coach Daniel Webster would have liked from his players last Saturday, where they were outplayed from start to finish in a 47-point loss to a side they were expected to beat in Sydney University. It was an off-day for many of Aspley’s experienced players, with 64 of the Students’ 107 points coming from turnovers. It will be a match they would want to forget quickly ahead of a tough challenge against the Sharks. On the other side of the ledger, Southport proved it hasn’t lost any of its class this year with a sublime display against the Bombers to kick off its title defence. New recruits Matt Shaw (29 disposals), Jamison Shea (22 disposals, 10 marks, 3 goals), and Josh Williams (15 disposals, 6 inside 50s) had an immediate impact, and the usual suspects of Tyler Roos, Michael Manteit and Andrew Boston found plenty of the footy. No signs of a premiership hangover just yet. An intriguing subplot to this contest is how Southport’s famed running game can adapt to the smaller oval at Aspley. The Sharks had 13 running bounces last week – the most of any side in Round 1 – and loved to burn opposition sides by using space to their advantage. Defensive pressure is key to Aspley’s fortunes this week to limit the Sharks’ forays into attack. Both the Bombers and the Demons have something to prove this weekend, with the Bombers desperate to rebound from a disappointing loss to Southport, and Canberra hoping to show that its gritty victory over the SUNS was no flash in the pan. Redland will be keen to keep its hopes of an improved 2019 campaign alive, and to give home fans reason to be excited for the season’s remainder. A competitive showing is the benchmark for these Bombers. Coming off the back of an 11-point win at Alan Ray Oval, the Canberra Demons would love to go 2-0 to start their season. Redland has won only three of their last 16 matches at Scottsdale Park, the most recent of those victories coming in Round 19 of 2017. In Phil Carse’s bid to revitalise the Bombers in 2019, Scottsdale Park needs to become a ground where Redland is able to hold their own. The young Canberra stars showed no signs of slowing against the SUNS, with Angus Baker nominated for the Rising Star Award following 36 disposals, three inside 50s and five marks, as well as Mitch Maguire coming off the back of a breakout year who finished with 35 touches, three tackles, six clearances and a goal. The form of these two will dictate heavily the success of Canberra’s 2019 campaign, and this weekend will be no different. Matt Hammelmann, leading goalkicker of 2018 across the competition, managed to slot three of his side’s seven majors, and Redland will need him to continue to stand up against the Demons. Don’t be surprised to see him push further up the ground to impact the contests on the flanks and wings. The first match of Round 2 sees the GIANTS match up against another AFL club in the Brisbane Lions. The GIANTS are coming off the back of a 29–point defeat at home at the hands of James Rose and the Sydney Swans. Meanwhile, the Brisbane Lions are going to be full of confidence heading into the match after their biggest ever win over the NT Thunder. 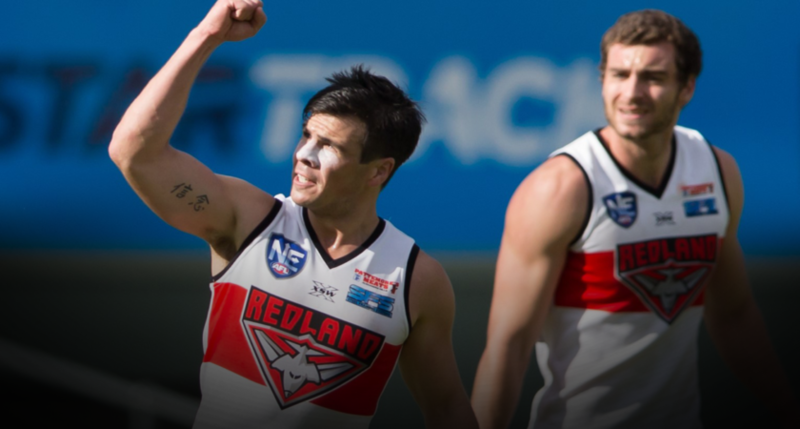 This match-up is likely set to feature plenty of AFL-listed players from both teams with eyes on gaining a place in their respective AFL teams. The GIANTS will be wanting to prove that they are going to be a force within the competition after their list has been depleted through injury over the last two seasons. The Brisbane Lions will be beaming full of confidence after the AFL sides dream like start for the first three rounds as well as their biggest winning margin over the NT Thunder last week. The Lions will be looking to make an even stronger statement with a win over the GIANTS side, and sending a message to the competition they mean business in 2019. The GIANTS will be wanting to come back from their 29-point defeat last week and a win against the rampaging Lions could be the kick-start to their season they need. If not an 0-2 start will be hard to come back from in another close competition this year. A battle between two young emerging big forwards could be on the cards for Saturday as the Lions’ Tom Cutler managed to kick four majors as the GIANTS’ Zach Sproule kicked three of his own. Could we see a big bag of goals from both leading forward targets? The Gold Coast SUNS host the Sydney Swans in this Round 2 matchup of the 2019 NEAFL season. The Swans tasted victory last week in their opening round against the GIANTS whilst Gold Coast went down to Canberra Demons on the road. The SUNS were slightly understrength with only 13 listed players as well as some talent missing as they participate in the NAB League, whilst the Swans had 16 listed for their match against the GIANTS. Leading into the this week, the SUNS will be looking to string together some consistent football after an impressive final term last week against Canberra nearly saw them steal the chocolates. Sydney, on the other hand, will be striving for much more of the same after recording a relatively comfortable win in Round 1. It was a case of so close, yet so far for the SUNS last week when they trailed Canberra by 40 points leading into the final quarter, before four unanswered goals in nine minutes brought them to within 11 points. Canberra ultimately held on to win, but Gold Coast proved it can certainly pack a punch. Coach Nick Malceski will want to see four quarters of that form coming in to battle against the Swans this week. The Swans led at every change in their opening matchup against the GIANTS, despite the hosts remaining close with Sydney, they were able to close out the match 29 point victors with relative ease. They’ll field a similar side this week against Gold Coast, with speedster Ryley Stoddart and Matthew Ling coming in to the side with Justin McInerney and Kieren Jack elevated to the AFL. They showed plenty of class in Round 1, and are in a good position to continue their winning ways against the SUNS. What about the dominance of James Rose? Not a bad game for the 22-year-old last week with 39 disposals, nine clearances, 11 inside 50s and four goals. He missed out on an AFL call-up, but this young gun will make life difficult for Gold Coast if they cannot contain his dominance.